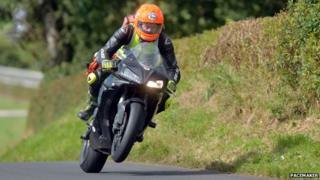 Dr John Hinds, one of the so-called "flying doctors" of Irish road racing, has been killed at a motorcycle event in the Republic of Ireland. Dr John Hinds and his colleague Dr Fred McSorley, known as the "flying doctors", have long enjoyed near legendary status among race fans. "Hospital medicine has become very much full of protocols and guidelines - out here it's a wee bit more 'seat of your pants' medicine really," he said. "And it's very rewarding to be able to treat people that way: where you don't have a sterile operating field and you're not in a resuscitation bay; you're very often in a ditch somewhere." Mr Hamilton said Dr Hinds was a "lovely guy who will be sadly missed". "He was one of our leading trauma experts. He was driven with a great passion to try and improve the chances of those involved in serious accidents. My thoughts are with his family. "I do hope as a lasting tribute to him, the government will now push ahead with his ambition to have a proper air ambulance service for Northern Ireland. "It would be very fitting for Dr Hinds," he said. The Northern Ireland Ambulance Service (NIAS) tweeted: "Saddened to hear reports of the untimely death of Dr John Hinds - a friend to many in NIAS." Members of London's Air Ambulance service said Mr Hinds "was a true friend and advocate of the air ambulance community".